Having surgery can mean entering a room full of strangers. And behind the masks and scrubs, it can be hard to tell who's who. As it turns out, salespeople are frequently present in the operating room. They are there because their company makes a medical device that a doctor is about to implant. This has been going on for years. And as Blake Farmer of member station WPLN in Nashville found, the practice is now under new scrutiny. BLAKE FARMER, BYLINE: Hip and knee replacement is becoming so routine that a surgeon can operate nearly in silence, other than the hammering on bone. FARMER: During a hip replacement broadcast on public television, the surgeon issues one-word commands. FARMER: When he needs part of the artificial joint or the special tool used to install it, it's placed in his hand by the scrub nurse. 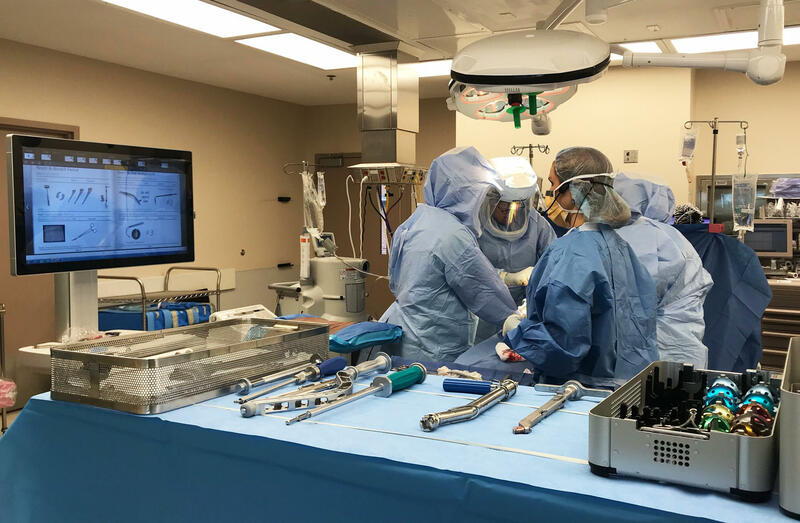 But if this surgical team hasn't worked much with this surgeon, he might turn for guidance to the medical device sales rep. Often, that sales rep knows the surgeon and the equipment better than anyone in the room. CHRIS STEWART: The back table of a OR is full of instrumentation. FARMER: Chris Stewart spent his sales career with Stryker, one of the biggest device manufacturers. STEWART: That's really where we come into play is knowing exactly what screwdriver to use, making sure that the screw is on the screwdriver. FARMER: Device reps are trained as if they might have to conduct surgery themselves. At an educational center in Colorado, they saw through bone to install an artificial hip. Sometimes they even work on cadavers. That helps them develop the steel stomach needed to watch a spike hammered into bone. STEWART: We have to know the anatomy of the body. You go through tests of why physicians use these types of products and how we can assist. FARMER: Hospitals don't have to open their ORs to sales reps. So Stewart now helps device companies navigate their relationships with hospitals. He argues it's valuable to have reps there. They've often seen more operations with their implant than the surgeon has. Plus they help with logistics, delivering trays of specialized tools each morning for sterilization. Dr. Michael Christie of Nashville specializes in new hips and values his rep.
MICHAEL CHRISTIE: I can't keep my socks together through the dryer. You can imagine trying to get 300 pounds of instruments all set up correctly because if that widget isn't there, we're kind of at an impasse. FARMER: But there are some inherent conflicts in these relationships. Many experienced surgeons like Christie get substantial payments from device makers, either royalties for their design contributions or speaking fees. And then there's the support reps provide in the OR. Dr. Adriane Fugh-Berman says licensed medical professionals should be doing that. ADRIANE FUGH-BERMAN: What we need are skilled helpers who are not making money off of the choices of the surgeons. FARMER: Fugh-Berman studies medical device sales at Georgetown University. She says reps are primarily interested in pushing their company's newest and most expensive product. FUGH-BERMAN: The newest device is not necessarily the best device. In fact, it may be the worst device. FARMER: She says it doesn't help that the FDA offers fast-track approval for some devices. One of them was a hip implant that was later found to be shedding tiny bits of toxic metal into patients' blood streams. But for hospitals, controlling device sales is a business issue. Nowadays, many insurers, like Medicare, are capping what they'll pay hospitals for a hip replacement. Every expense is now under scrutiny. BRENT FORD: I think there's more transparency with costs now. FARMER: Brent Ford was a device rep but now works for HealthTrust. That company handles purchasing for hundreds of hospitals and now strongly urges them to reconsider whether highly paid sales reps should be welcome in the OR. FORD: They feel like they're making too much money, and I think that's why they want them out. FARMER: And yet experiments with going rep-less (ph) are having mixed success. One of the first in Loma Linda, Calif., claimed to save a million dollars a year buying discounted devices direct from the manufacturer. But the hospital also had to hire additional staff to fill the rep's role. Recently, officials there admitted to NPR they've abandoned the effort. SHAPIRO: And this story is part of a partnership with NPR, WPLN and Kaiser Health News. (SOUNDBITE OF FREDDIE JOACHIM SONG, "CALM") Transcript provided by NPR, Copyright NPR.